Step 1: First a 3D render of the key items in the scene is generated. This render handles things that need to remain consistent in the scene. Typical examples include the Lawbringer cycle, common vending machines, and in this articular example. an arcology corridor. This ensures the perspective is right and the setting doesn't vary for no apparent reason. Step 2: This is meant to be a city with over half a billion people living in it. The vast majority of those people are faceless masses that don't mean a lot to our stories except as context. So I add in some silhouette figures always in the background. Step 3: Add some posters, some signage, some graffiti... Generally I like to make sure that these elements tell a bit of a story in themselves. S the signage is the sort of thing you'd find in a tyical dystopian setting, while the wall graffiti implies the sinister cults that I've mentioned in the rules. The Lawbringer needed a few features to make it feasible as a vehicle for our Agents of the Law. It needed mirrors, headlights, indicators, seat cushioning, footplates, display consoles, and handlebars. To add a bit more to it. I've also added Department of Law insignia (to the front, and on each side at the back), and some cooling fins to the main engine at the rear wheel. I'm working on the assumption that these bikes will be electrically driven, so there's no real need for a massive engine assembly in it. ...and I think we're basically done. Now it's time to move on to the uniforms of the Agents of Law, and their two signature firearms (the taser used by training agents and the multi-purpose multi-ammo assault pistol used by full agents). Agents of the law have signature equipment. Often these pieces of equipment have the word "Law" in their title somewhere. The vehicles that bring Agents of the Law to the scene of a crime are the "Law-bringers". These are lightly-armoured, highly-maneuverable cycles designed for high speed alley chases and highway patrol. There are generally four types of Lawbringer Cycle; one is a base model that most agents start with, and three are upgraded variants assigned to sergeants and captains of the department. The three upgraded variants either have heavier armour, AI navigation systems, or are hovercycles. Still needs more layers though.I want this to remind me of my trip to Tokyo, massive density, things going everywhere, elevated motorways and mass transit systems, this is meant to be a city for half a billion people to live in...and it needs to look like it. Not only that, it needs to look like the people in charge of town planning have the same level of regard for the general populace as Donald Trump does....and people like that have been in power for decades. This setting is dark, mean, might unclean. More image experimentation to do. The following images were meant to accompany the previous post. And here, it is after fiddling with it in Photoshop a bit. And this version is grittier still, but verging on illegible. Some days I think this is exactly what I'm after, some days I think that this has pushed things too far. While I've been busy working on university stuff, I've had backup computers rendering collections of buildings that I've made in 3D modelling software. I think I need more building types to add into the mix...many, many more building types,...because everything is looking a bit too regular at the moment. Sure, there need to be some areas of regimented order, but the setting isn't about that...the setting is about a world contstantly on the brink of anarchy and rioting. There needs to be more chaos. A few days ago I shared my current work in progress, The Law. It didn't have any images in it, so it's time to start remedying that situation. 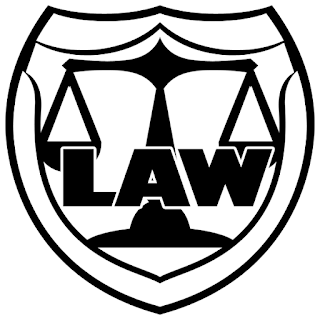 The first images I've started on are the badges of the Agents of the Department of Law. I'm not sure they're quite right yet, but they are close to what I'm after. The armoured uniform is giving me a few more issues. I'll post those images soon. One of the things I liked about the World of Darkness was the specific potential for telling very different stories in the same world. I guess that D&D was doing that for years previously, where you could cross dark stories into any setting by applying the Ravenloft rules to whatever setting you regularly played (or Spelljammer if you wanted pseudo-spacefaring, or Planescape if you wanted something a bit more metaphysical). But the World of Darkness claimed to produce distinctly different urban fantasy horror stories all set in a single rich world that didn't require jumping between worlds or planes to change the tone of each story. In this alley, werewolves were ripping apart a corporate executive who had greenlit a gas-mining exploration plant in a delicate ecosystem, while two alleys over a pair of vampires were delicately settling a blood feud that had been ongoing for centuries (by similarly pounding the crap out of each other). +Paul Stefko has put together a series of blog posts describing his reflections on reading the original Vampire the Masquerade book, now over 25 years old. At this time of writing this blog entry, he is up to the fourth installment and has basically finished the core text, with a promised post to reflect on the whole book, and where it basically went after that point. It's one of those things I've tried to do a couple of times here, I can't remember if I actually completed it in any depth, but I know I've done a few cross comparisons of how different games are laid out. It's interesting to see so eone else's take on the subject matter. Here's a copy of The Law. It doesn't have images in it, but just imagine dark-gritty-noir-cyberpunk-2000AD-Dredd inspired images all through it. It was the mid 90s, a few RPG companies were starting to experiment with settings and work with derivatives that ventured beyond their bread-and-butter game lines. It was the first time I was at University, and I had started going to RPG conventions to explore games outside my element. Specifically, I'm thinking of 1995...White Wolf had designated it "The Year of the Hunter". Eachof the Five main game lines had a sourcebook released, each specifically linked to the theme year. I can't remember if this was their first in the "Year of..." series, there was a similar "year of the Sidekick" (or some such thing) that came just before or just after this. Late there was a "Year of the Lotus" with Asian themed versions of all their game lines. Pseudo-Dredd now has a name. But it has run into my inevitable quagmire of expanding word count. The idea was to wrote up a basic 16 page comic, print it in the form of an '80s 'zine. Crudely printed on a photocopier, black and white, stapled...maybe with a cover using heavier weight coloured paper..again printed with a black toner photocopier. There would be enough in the rulebook to run a game, but it would be richer when added to a notebook filled with images of the tower setting, where a group could either buy the prewritten setting (where I scribbled over the pages describing the inhabitants and the stories within), or they could buy the 'blank' version of the notebook (which was still filled with maps and images, but had heaps of room for players to write in their own exploratory notes). The tower project I was working on a couple of months ago was a part of a larger plan...I don;t know if it was a part of a larger plan at the time when I was doing it...or if it was, I don't know if that plan is the same plan that it's now a part of. Either way, another fragment of the grand plan is a fairly simple RPG, based loosely on a Judge Dredd concept (with serial numbers filed off). Here's the first few pages. Illustrations, character sheet and the remaining pages coming soon.